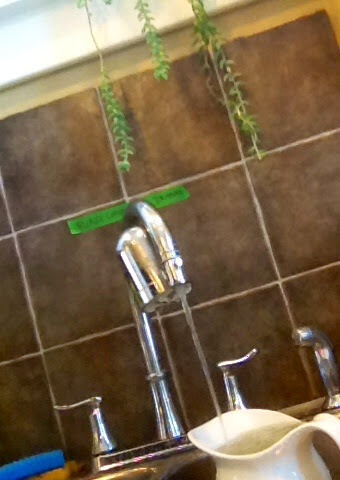 If you're looking at our kitchen faucet and wondering what the green tape sign says, it says..."Please leave water dripping." I bet for many people reading this, they are totally confused. Why is a person who cares about environmental issues a little bit, one married to a biology professor, purposely leaving her water dripping? We're on the risk of frozen pipes list. In Winnipeg, it is still most definitely feeling like winter. Yes, the sun is a bit brighter and spring is slowly moving northward. (we hope.) The ground is still ice and snow covered, and boy, that snow is looking dirty! This morning when I walked the dogs, it was -6F. Right now, it is -15C, or 5F, with bright sunny skies. This winter is the coldest Winnipeg has seen in 35 years, and the frost line-that is how deep the frost goes beneath the soil- is at around 8 feet. (2.5 meters or so) You might guess, if you were thinking about plumbing, that there are water mains at that depth, and you'd be right. Water mains are breaking in Winnipeg, and a whole lot of houses in our city do not have water. Our next door neighbor's pipes are frozen, and she has water because her water line was connected with the neighbor on the other side of her house. We live on the corner, and our one neighbor has no water and is connected to the other neighbor. We hope our pipes don't freeze. In our favor, we have twin two year olds and use a lot of water so it is still flowing! We run the dishwasher and washing machine every day (potty training, but still using our share of cloth diapers...!) and that has helped. Then in mid-March, we heard our neighbor had lost water and we started the trickle at the kitchen sink, 24 hours a day. The city put us on the at-risk list and may compensate us for some of the water loss...but it is a necessary cost, no matter who bears it. We so don't want to lose water! If I think about it (and I try not to), this situation begins to sound like one of those bad comedies where things have to be funny so you don't cry--there are businesses and homes here who have been without water for weeks. The professor talks about our "coy pond" and makes jokes about streams, water falls, and fountains. In between my sleep deprivation (the boys have had a cold and they just don't sleep through the night) and the dripping water and a sinus headache or two, I think maybe I am feeling a little like I know how people in horrible war time work camp environments might feel. (just kidding, definitely a first world comment) I am even more upset now that so many people in the world do not have easy access to clean water...just the threat of it is scary to us. We collect the water in the pitcher and try to water plants, fill the dog bowl, our water glasses, etc. with it, but we're using a lot of water. Luckily, we are blessed with a lot of water here in Canada. Drip drip drip. Can you hear it running over there at your house? I so can't wait for spring. Please drop me a note or leave a comment or something if you can see flowers or the ground or even a melting pattern where you live! I'd really like to get back to posting more frequently, so this is a speedy attempt. Here are some (not very good) photos I've taken with my iPad to show off recent knitting and life here. 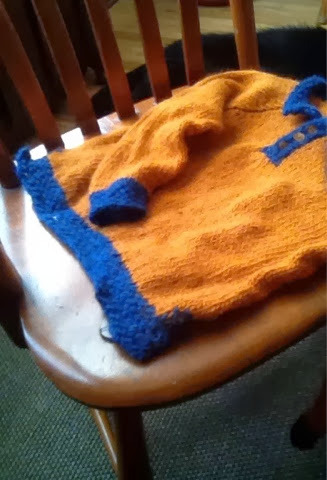 I have finished my version of Kapp, an Icelandic sweater pattern with Lite-Lopi in Size 4. It is too big for our boys now but will be just right come next fall, I suspect. It was a pattern that required the knitter to already know how to do an Icelandic type sweater. (in the round, bottom up, attach two sleeves and do a yoke, etc.) The instructions were well-intended, but minimal. There is a mistake in this, and it is around the collar area, and I hope you can't really see it because of the buttons (ancestral button stash buttons!) the slanty photo and the collar. :) Whatever, it will keep someone warm! Now I am on to the next sweater. This will be a stripy zip-up-the-front one, I suspect, as requested by my (skinny) boy, unless he goes for buttons at the last moment. He likes long coatlike sweaters, and this one is being knit at a size 2 width but size 4 length. There is no pattern to this. I am just making it up as I go. Winging it for me is only slightly more complicated than following a well-intended pattern without many details! 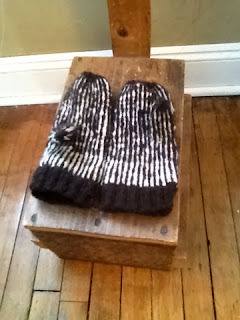 Long ago, I started a pair of Selbuvotter mittens, using a pattern from Terri Shea's great book. However, things got distracting and I found I just could not concentrate on finishing those mitts at the time. Hah. You know, when I was writing books and getting ready to move to Canada, but not yet the mom of twins....well, it was the twin thing that did it, I guess. Put me right over the top. I just cut the handspun right off the half mitten I'd done and started winging it. I made some top-down mitts in the 20 minutes before I fell asleep or during odd moments here and there. They fit fabulously and I was ready to go when I looked at them. They looked sort of, umm, homespun. Not bad, but just sort of homemade in a way I wasn't quite satisfied with wearing out and about. 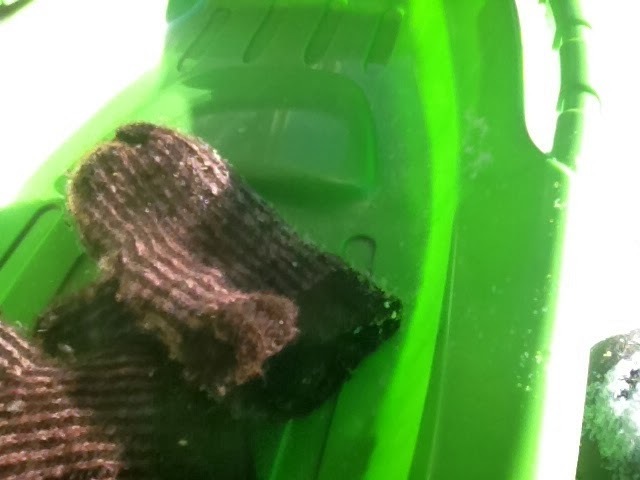 I washed the mitts, gently fulling them in the process. Then I grabbed some grape kool aid packets on a grocery store errand, and the mitts took a little dip. They now are a lovely variegated purple/lavender contrasted with rich brown. They look good and more importantly, they feel very warm, especially with another pair underneath. Sadly, they do not photograph well in the spare moments when I have a chance to shoot a photo. 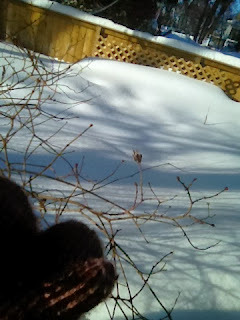 Today I was out shovelling and I tried all sorts of angles in the sunlight. There is very definitely lots of "winter" out here, and while the temperature is tropical (-10 C, around 20F), I still wear mitts when shovelling. Here's a failed shot of mitts that shows some snow drifts. 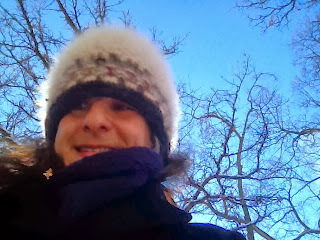 Here's also a photo of me in my winter gear. I've made 2 pairs of mittens for myself this winter and I am now on to a third...I wonder whether winter will beat me and I'll have three new pairs of mitts by the time the snow is done, or -- maybe, (hah) spring will come first. I somehow doubt it! PS: I've now managed to download all the currently available pdf patterns from my both of my books to Ravelry...but no one has bought a single one of the new downloadable patterns yet! 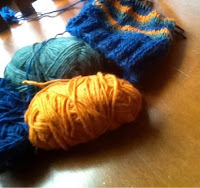 There's still time to make mitts before spring! Join me...? Oh, for the days of the Pony Express! As of 8 this morning, I have already been given a hand-delivered note by a neighbor who says she wholeheartedly agrees. I did not think that being so frustrated by the mail this winter would result in getting additional (hand-delivered) mail! On another topic--I am slowly uploading more patterns from my books to Ravelry. Check out this Knit Green link to see which pdf downloads are now available. More to come soon!